Similarly, when you make a quilted sweatshirt jacket, combining fabric colors and patterns that reflect your personal style, you will end up with a creation that’s uniquely you. That’s why these jackets make such great additions to any wardrobe. You simply personalize them according to individual interests and add the desired embellishments. Using holiday fabrics and patterns you can make a sweatshirt jacket for every season! In addition to being very personal, quilted sweatshirt jackets are relatively inexpensive. As retailers make way for spring and summer fabrics, fleeces are typically discounted to $3 or $4 per yard. You only need 2 yards of 60" wide fleece to make one of our scrappy 'Not Quite a Sweatshirt' jacket designs. You may also want to try our micro-fleece available in 10 colors. This is a non-bulky alternative to sweatshirt fleece. It is soft and smooth with just a bit of stretch. You can create quiltwear that feels more like a sweater than a quilted jacket. And what quilter doesn’t already have a million pieces of fabric lying around that could be put to good use? There are a dozen and one ways to de-construct sweatshirts and layer them with beautiful fabrics. 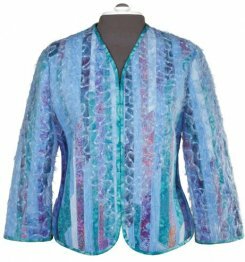 However for chic, sophisticated piecework fashions that are as decorative as they are functional try our 'Not quite a sweatshirt' jacket designs, for a jacket that fits like a glove. So, to paraphrase a quote found on quilting, when life hands you scraps, you might as well make Figure Flattrering Quiltwear!